Before my senior year of high school, my parents joined our local country club. Mom mainly wanted a membership because she loved to swim laps during the summer, and she rarely could in the overcrowded city pool downtown! As part of the membership, the country club extended an invitation to attend their brunch on the last Sunday of each month. Although we didn’t make it to every one, we still went multiple times throughout the year, especially during the warmer summer months where we could sit on the outdoor patio overlooking the beautifully landscaped rolling green hills. The brunch was a buffet-style affair but with the most gourmet dishes imaginable: eggs benedict, made-to-order omelets, six different types of salads, chicken cordon bleu, hot hand-carved ham, mimosas, Belgian waffles… Along with traditional French toast, bacon, scrambled eggs, hash browns, sausage, home fries, and more. But my favorite part (aside from the entire dessert table!) was the big assortment of freshly baked pastries right next to the fresh fruit. Rolls, bagels, donuts, scones… With their buttery flavor and tender texture, the latter two were always so tempting! 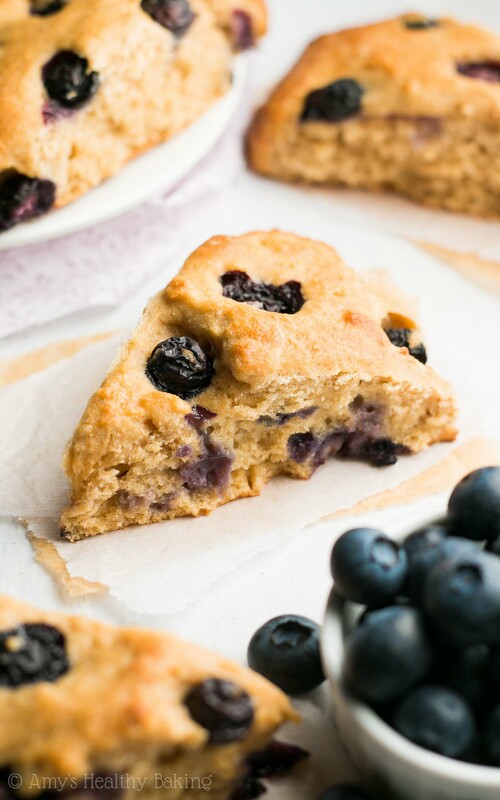 Since I haven’t been able to make it to those special brunches with my parents for a while, I decided to satisfy my craving at home—starting with these Ultimate Healthy Blueberry Scones, of course! They’re just as buttery and tender as the ones at the country club, but these contain no refined flour or sugar… And just 137 calories! Even better? You just need 30 minutes to make them! And when it comes to gourmet brunch recipes, that’s a true miracle in my book! You can watch the episode below where I show you how to make these healthy blueberry scones and get my recipe directly beneath the video. And remember to subscribe to my TV show here, so you’ll be the first to know when a new episode airs each week! 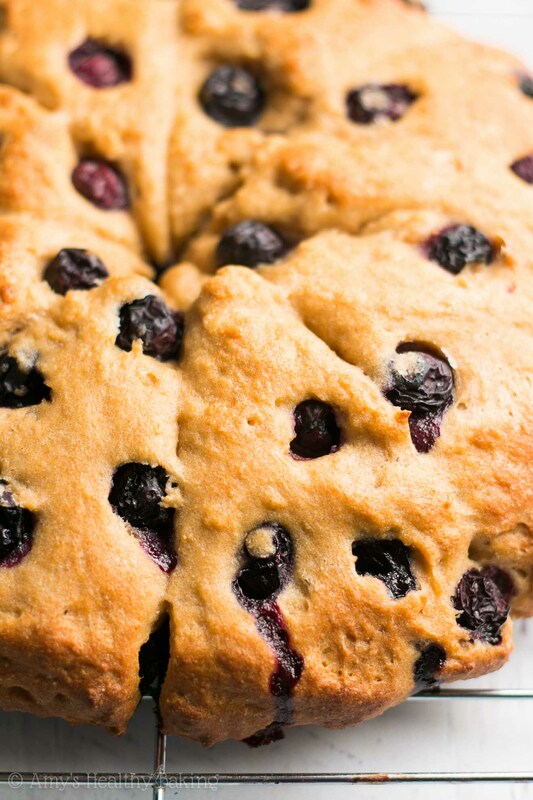 You can find my Ultimate Healthy Blueberry Scones recipe HERE! Ah yes, a classic brunch treat – scones! I appreciate the tips about why you use cold butter and brush milk on the outside. Another winning recipe that proves healthy doesn’t mean sacrificing a worthy treat! And I loved the “The End” declaration at the end of the video, haha. Scones are one of my favorite breakfasts/snacks/desserts. I would even choose a scone over a piece of cake most of the time! Lol. I will have to try this recipe! I eat scones for all three too! 😉 I’d love to hear what you think if you try these scones! You are radiant my friend, always glowing in these videos!! Those scones look so amazing. We would have been good friends living at the pastry table as children! HA. Thank you for this stunning recipe! My partner made these for me for mother’s day as I have just started on weight watchers. I can’t believe how low in points these are and they were absolutely delicious. I had them with a tiny smidge of butter and a teaspoon of honey drizzled over for an extra point. I’m looking forward to trying some of your other recipes! I’m so glad you loved these scones Louise! Thanks for taking the time to let me know! I love your idea of adding a bit of butter and honey. Yum! 🙂 I’m so excited to hear what recipe you and your partner decide to try next!